Found in Hangzhou, Zhejiang, China. All duplicated entries must be deleted! What lurks behind the shiny door. Piss up or pisss down? I think I’ve seen this piss before. The worthy winner of 2012 Plain Engrish award. But what if I have to do #2? Is there a crap room anywhere? The room is half full. The whole room? Well, I’ll try. @Crazy M: Twice? You seem to be bi-assed against the piss room. 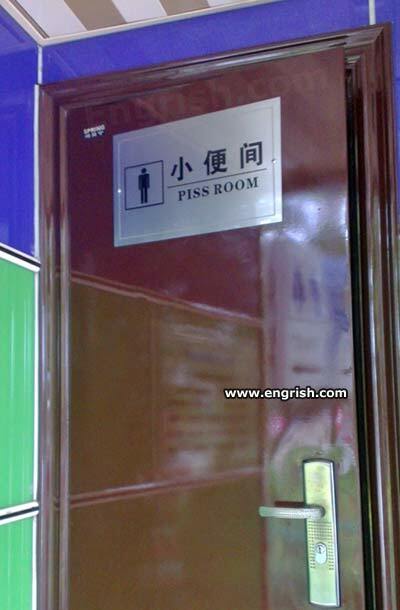 You can never have enough room to piss. Can you fit Uranus in there too? Working towards world piss, one room at a time. Nothing says bring the room together more than blue and green tiles, a super shiny burgundy door and striped ceiling. Designed by that world famous architect, I.P. Plenty. This is the Piss Room! Take ur crap elsewhere!! Inside there was a sign that said “Wet Floor” – so I did.